CLASSIC Join a Guided Tour of breathtaking Keukenhof—known as the “Garden of Europe”—for its 70 acres of lush parkland, lakes, and the world’s largest flower gardens—with more than seven million tulips, daffodils and hyacinths as well as other bulbs, planted each year. If you’re passionate about gardening, or you simply love nature, this Tulip Time cruise is for you! A special interest departure designed with inspirational horticultural art in mind to include the magnificent 70-acre gardens of Keukenhof. Special features combined with the season of endless rows of blooming colors make your cruise through Holland and Belgium one to be pressed in the memory books. Begin your vacation before your cruise with a night in Amsterdam and a canal cruise with an expert Local Guide. 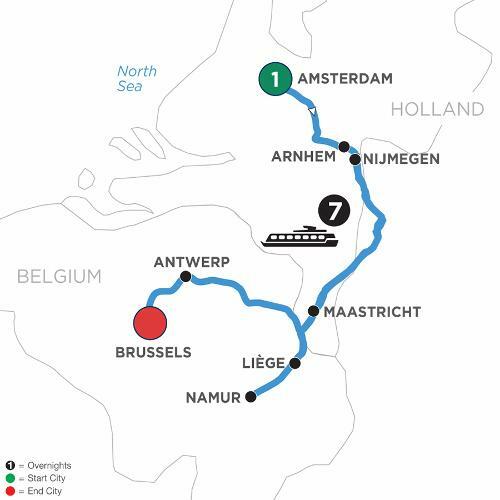 Board your Suite Ship® for a view filled with windmills and blooming fields of color in Holland and Belgium on your European river cruise from Amsterdam to Brussels! Cruise on the Rhine River with a visit to Arnhem’s WWII Airborne Museum, and join your ship in Nijmegen and visit the lovely forest setting of ‘s-Hertogenbosch to sample decadent Dutch chocolate desserts. You may alternatively visit a fruit and flower farm to hear the history of a 15th-century windmill. Take a carriage ride through the nearby nature reserve to watch for herons, storks, birds of prey, and wild horses. In Maastricht, tour the old cobblestoned university town, or visit a working mill to make Limburg pie. Accompanying your cruise is a botany expert who shares fascinating facts about gardening and the world of plants. You’ll learn a lot with knowledgeable onboard lectures on your Garden & Nature Lover cruise. Memories of Holland and Belgium will bloom in your memory for seasons to come!